Due to family illness & then illness myself it has been a tough year and as such just working to get orders out for my business has been tough. Bills need to be paid though, so work must go on!!! Anyway i'd like to share with you a knitted blanket I made whilst I was recuperating from my operation. Being the type of person who gets bored sitting still for two mins, knitting was the perfect hobby to take up. 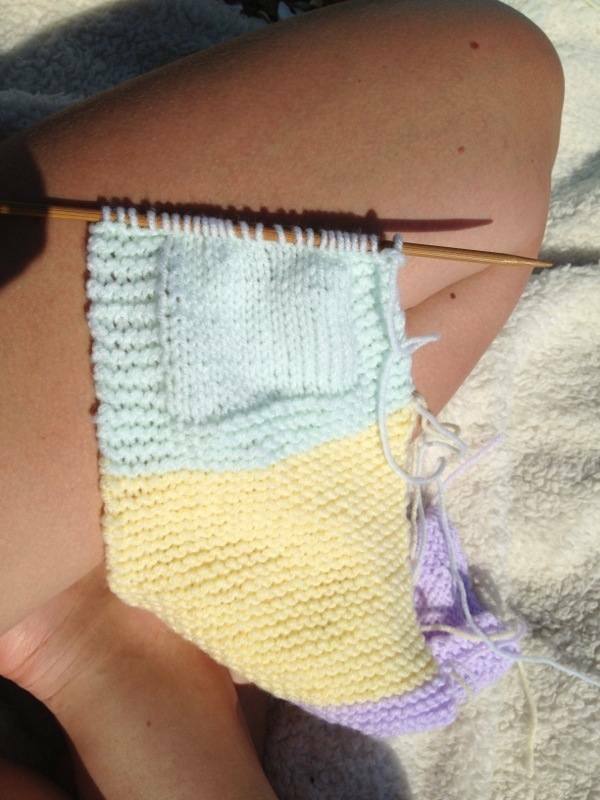 I must admit I hadn't tried knitting since I was a little girl & even back then I couldn't cast on or do anything but a simple stitch, so the task I had of me felt like a great challenge!!! Fortunately for me, I had my very talented mother at hand to show me how & explain what the knitting pattern was trying to tell me! 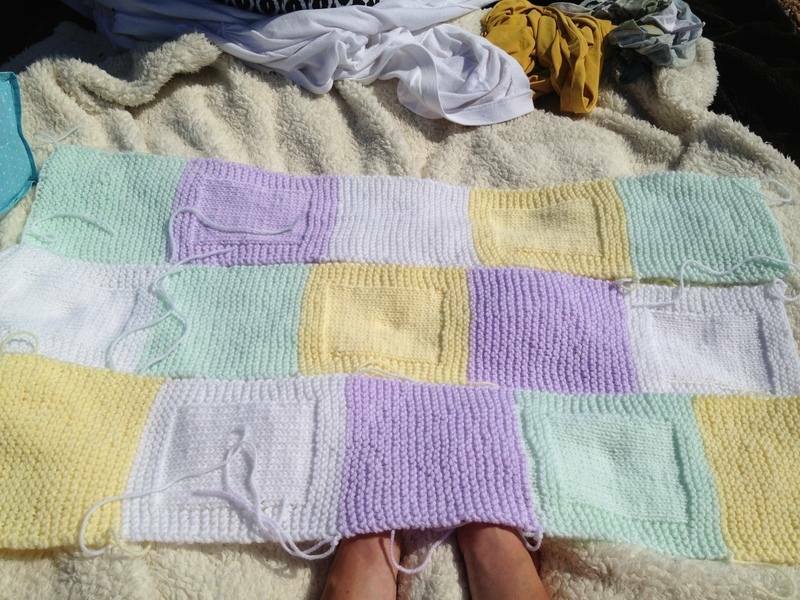 Below you can see a photo of my knitting visiting Brighton beach with me. 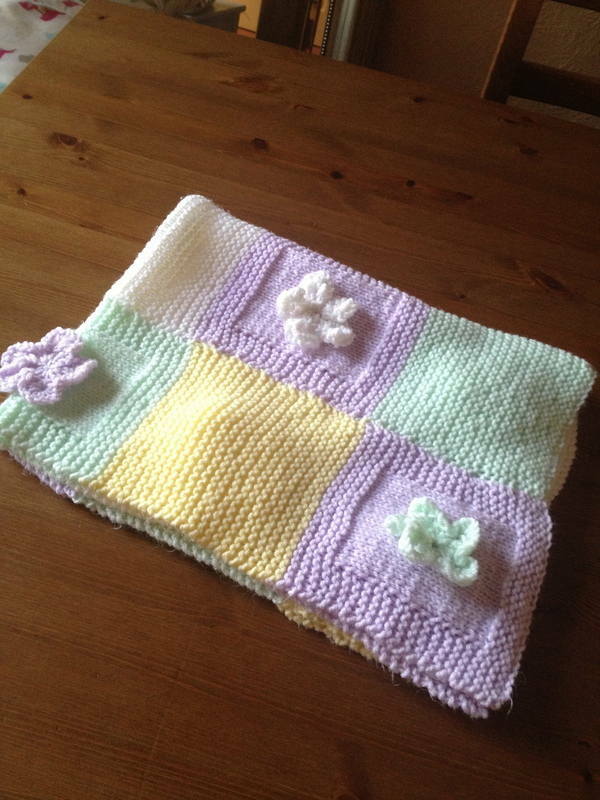 So if you fancy taking up knitting, I think the blanket is a great starter project. I was so pleased to get it finished & hand over the gift to my boyfriend's brother & sister in law. I might even make a larger one for my own bed! The blanket is made up of four strips with each having fives squares of alternative & relief pattern. Work 44 rows in garter stitch, change colour to start second square. Row two: Knit two *knit one, slip this back onto left hand needle, lift the next eight stitches on left hand needle over this stitch & off the needle, yarn over needle twice, knit the first stitch again, knit two* Repeat from *to* to end. Row three: Knit one, *Purl two together, drop loop from two stitches made in row two & (knit one, knit one to back of loop) into lip, purl one* Repeat from *to* to last stitch & knit one. Do not cast off, break wool & run through all stitches, draw up into a flower pattern & secure. Work in all ends of the blanket neatly. Lay your strips out as you desire & join the strips together using a matching wool & sew together. Work in the ends of the flowers & stitch to alternate squares on the blanket. 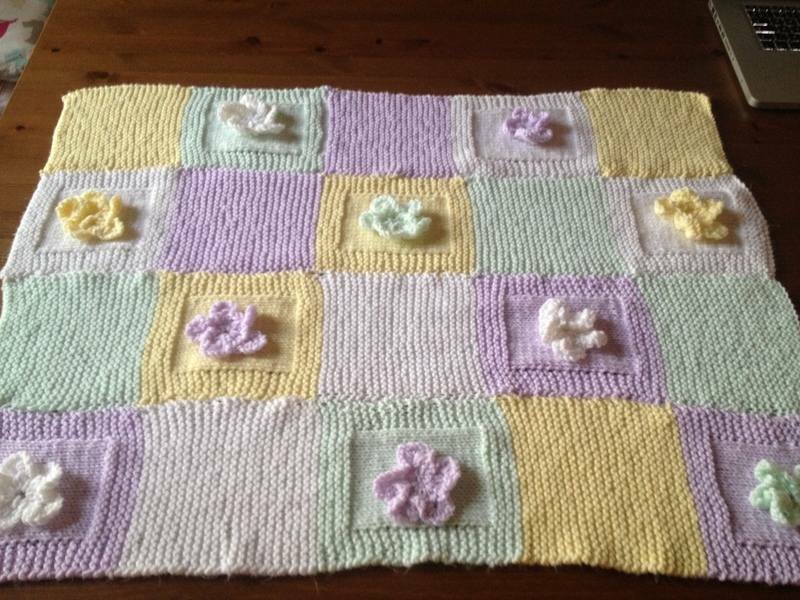 So there you have it a lovely flowers & squares blanket. I hope you enjoyed this little tutorial & sharing my first ever knitting project with you.